You can’t beat a log fire when it’s cold outside. The Napoleon NZ6000 Wood Fireplace is not only a classic, but is the perfect blend of rustic charm and modern technology. This fireplace has the largest firebox in the industry and an impressive 36″ wide by 22″ high door opening. This fireplace will be treasured for its quality and performance, and is hand crafted to last for generations. 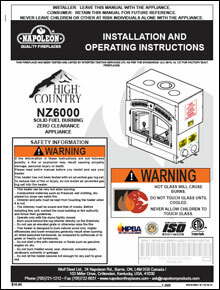 The firebox of the Napoleon NZ6000 Wood Fireplace features an advanced air wash system. This unique systems helps to keep the high temperature ceramic glass clean and gives you a better view of the luminous flames inside the firebox. Largest firebox in the industry allows for an overnight burn. Advanced air wash system helps keep the glass clean. Impressive 36″ wide by 22″ high door opening, giving the fireplace a large viewing area. Non-Catalytic technology ensures a clean burn. Utilizes outside air for combustion.